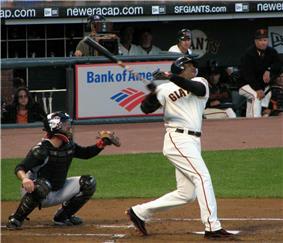 Barry Bonds joined the 500 home run club in 2001 and set a new career home run record of 762 in 2007. In Major League Baseball (MLB), the 500 home run club is a group of batters who have hit 500 or more regular-season home runs in their careers. On August 11, 1929, Babe Ruth became the first member of the club. Ruth ended his career with 714 home runs, a record which stood from 1935 until Hank Aaron surpassed it in 1974. Aaron's ultimate career total, 755, remained the record until Barry Bonds set the current mark of 762 during the 2007 season. 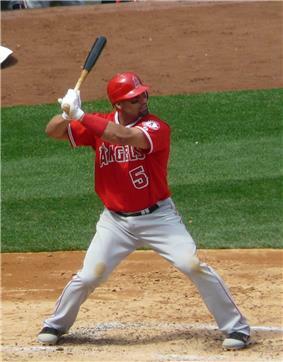 Albert Pujols is the most recent to reach 500 home runs, doing so on April 22, 2014. Twenty-six players are members of the 500 home run club. Of these 26 players, 14 were right-handed batters, 10 were left-handed, and 2 were switch hitters. The San Francisco Giants are the only franchise to see four players reach the milestone while on their roster: Mel Ott while the team was in New York, Willie Mays, Willie McCovey, and most recently Bonds. Four 500 home run club members—Aaron, Mays, Eddie Murray, and Rafael Palmeiro—are also members of the 3,000 hit club. Sheffield's 500th home run was his first career home run with the New York Mets, the first time that a player's 500th home run was also his first with his franchise. Alex Rodriguez, at 32 years and 8 days, was the youngest player to reach the milestone while Ted Williams, at 41 years and 291 days, was the oldest. Membership in the 500 home run club is sometimes described as a guarantee of eventual entry into the Baseball Hall of Fame, although some believe the milestone has become less meaningful in recent years. Four currently eligible club members—Barry Bonds, Mark McGwire, Rafael Palmeiro and Sammy Sosa—have not been elected to the Hall. Bonds and Sosa made their first appearance on the Hall of Fame ballot in 2013; Bonds received only 36.2% and Sosa 12.5% of the total votes, with 75% required for induction. Eligibility requires that a player has "been retired five seasons" or be deceased for at least six months, disqualifying four living players who have been active within the past five seasons. Some believe the milestone has become less important with the large number of new members; 10 players joined the club from 1999 to 2009. Additionally, several of these recent members have had ties to performance-enhancing drugs. Some believe that by not electing McGwire to the Hall the voters were establishing a "referendum" on how they would treat players from the "Steroid Era". On January 8, 2014, Rafael Palmeiro became the first member of the 500 Home Run Club to be removed from the BBWAA Hall of Fame ballot. As the BBWAA announced the selections for the Baseball Hall of Fame Class of 2014, Palmeiro appeared on just 4.4% of the ballots. Players must be named on at least of 5.0% of ballots to maintain their eligibility. 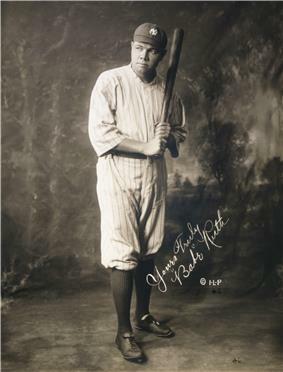 Babe Ruth was the first player to reach 500 home runs and set a career home run mark of 714 that stood until 1974. Albert Pujols is the most recent player to hit 500 home runs, one of 11 to reach the milestone from 1999 to 2014. Griffey, Jr., KenKen Griffey, Jr.
"Career Leaders & Records for Home Runs". Baseball-Reference.com. Sports Reference LLC. Retrieved July 15, 2010. "500 Home Run Club – Milestones". ^ a b "Progressive Leaders & Records for Home Runs". Baseball-Reference.com. Sports Reference LLC. Retrieved July 4, 2010. ^ "Albert Pujols hits 500th career HR". ESPN.com. Associated Press. April 22, 2014. Retrieved April 22, 2014. ^ a b c Ghiroli, Brittany (April 18, 2009). "Sheffield joins elite club with No. 500". ^ a b Hoch, Bryan (August 4, 2007). "A-Rod belts historic 500th homer". ^ a b Curry, Jack (April 27, 2008). "500 Home Runs, Zero Certainty for Thome". ^ Romano, John (April 22, 2009). "Gary Sheffield's 500 home runs is merely a number, and not a very special one". ^ a b Swartz, Cody (April 19, 2009). "Why 500 Home Runs No Longer Guarantees Admission to the Hall of Fame". Bleacher Report. Retrieved July 15, 2010. ^ "2013 Hall of Fame Vote a Shutout" (Press release). National Baseball Hall of Fame and Museum. January 9, 2013. Retrieved January 9, 2013. ^ "Rules for Election". National Baseball Hall of Fame. Retrieved July 15, 2010. ^ "Bonds says Rose, McGwire belong in Hall of Fame". ^ "McGwire denied Hall; Gwynn, Ripken get in". ^ "Rafael Palmeiro Becomes First Fatality of PED Era". ^ "Barry Bonds Statistics and History". Baseball-Reference.com. Sports Reference. Retrieved July 15, 2010. ^ "Hank Aaron Statistics and History". Baseball-Reference.com. Sports Reference. Retrieved July 15, 2010. ^ "Babe Ruth Statistics and History". Baseball-Reference.com. Sports Reference. Retrieved July 15, 2010. ^ "Willie Mays Statistics and History". Baseball-Reference.com. Sports Reference. Retrieved July 15, 2010. ^ "Alex Rodriguez Statistics and History". Baseball-Reference.com. Sports Reference. Archived from the original on 12 July 2010. Retrieved July 15, 2010. ^ "Ken Griffey Statistics and History". Baseball-Reference.com. Sports Reference. Retrieved July 15, 2010. ^ "Jim Thome Statistics and History". Baseball-Reference.com. Sports Reference. Retrieved July 15, 2010. ^ "Sammy Sosa Statistics and History". Baseball-Reference.com. Sports Reference. Retrieved July 15, 2010. ^ "Alex Rodriguez Statistics and History". Baseball-Reference.com. Sports Reference. Retrieved July 15, 2010. ^ "Mark McGwire Statistics and History". Baseball-Reference.com. Sports Reference. Retrieved July 15, 2010. ^ "Harmon Killebrew Statistics and History". Baseball-Reference.com. Sports Reference. Retrieved July 15, 2010. ^ "Rafael Palmeiro Statistics and History". Baseball-Reference.com. Sports Reference. Retrieved July 15, 2010. ^ "Reggie Jackson Statistics and History". Baseball-Reference.com. Sports Reference. Retrieved July 15, 2010. ^ "Manny Ramirez Statistics and History". Baseball-Reference.com. Sports Reference. Retrieved July 15, 2010. ^ Browne, Ian (June 1, 2008). "Manny cements his place in history". ^ "Mike Schmidt Statistics and History". Baseball-Reference.com. Sports Reference. Retrieved July 15, 2010. ^ "Mickey Mantle Statistics and History". Baseball-Reference.com. Sports Reference. Retrieved July 15, 2010. ^ "Jimmie Foxx Statistics and History". Baseball-Reference.com. Sports Reference. Retrieved July 15, 2010. ^ "Ted Williams Statistics and History". Baseball-Reference.com. Sports Reference. Retrieved July 15, 2010. ^ "Willie McCovey Statistics and History". Baseball-Reference.com. Sports Reference. Retrieved July 15, 2010. ^ "Frank Thomas Statistics and History". Baseball-Reference.com. Sports Reference. Retrieved July 15, 2010. ^ Kieser, Joe (June 28, 2007). "Thomas launches No. 500 at Metrodome". ^ White, Paul (April 22, 2014). "Albert Pujols: 500 home runs, and looking like old self". USA Today. Retrieved April 23, 2014. ^ "Ernie Banks Statistics and History". Baseball-Reference.com. Sports Reference. Retrieved July 15, 2010. ^ "Eddie Mathews Statistics and History". Baseball-Reference.com. Sports Reference. Retrieved July 15, 2010. ^ "Mel Ott Statistics and History". Baseball-Reference.com. Sports Reference. Retrieved July 15, 2010. ^ "Gary Sheffield Statistics and History". Baseball-Reference.com. Sports Reference. Retrieved July 15, 2010. ^ "Eddie Murray Statistics and History". Baseball-Reference.com. Sports Reference. Retrieved July 15, 2010.